NOTE:This product contains Natural Rubber Latex which may cause allergic reaction in some individuals. I HIGHLY RECOMMEND THIS PRODUCT FOR PAIN FREE REMOVAL. Keep In The Medicine Cabinet. Keep In The Trunk. Outdoor Activities. Excellent wrap. 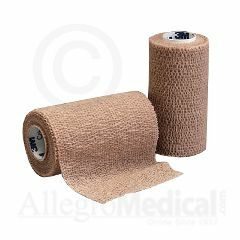 I use it over soft roll of Kerlix gauze to wrap my swollen leg that has an ulcer on iut. Easy To Use. Can reuse a few times. I have Pyoderma on my shin and I use a lot of Telfas gauze and such. The Coban wrap is quick, easy and painless. wish I had ordered 6.